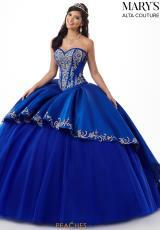 Feel like modern day royalty in this impeccable ball gown MQ3020 by Mary's. 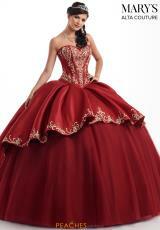 Regal and sophisticated, this delightful style features a strapless sweetheart neckline and full tulle a line skirt. Lavish lace appliques adorn the corset bodice highlighting an opulent embroidery that is simply remarkable, while it gracefully transitions onto the overlay of the skirt. The vintage chic ball gown skirt flows effortlessly with every step you take, while the elegant sweep train makes for a memorable exit.